Sorry for the late notice, this month our Beyond Bob Doubles practice will be at Wonston on 27th February from 19:30 to 21:00, all welcome from the Winchester District and beyond. Members of the Ladies Guild recently rang a peal at Wonston in memory of Valerie Keel, a ringer there for over 30 years. The band in ringing order (left to right) with, in the centre, Val’s twin sister Mary. If any of you listen to Radio Solent early on Sunday mornings you may know the faith show which is broadcast to Hampshire and Dorset before 8.00 am. 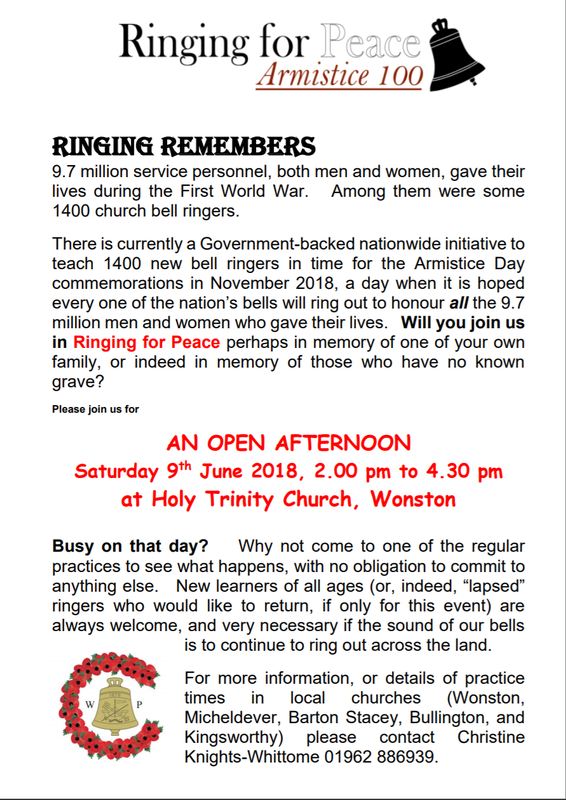 A couple of Saturdays ago one of the presenters, Katie Martin, came to Wonston with her team and made some recordings in the tower about Ringing Remembers and its background, how people can get involved in preparation for the Armistice commemorations, and bell ringing in general. 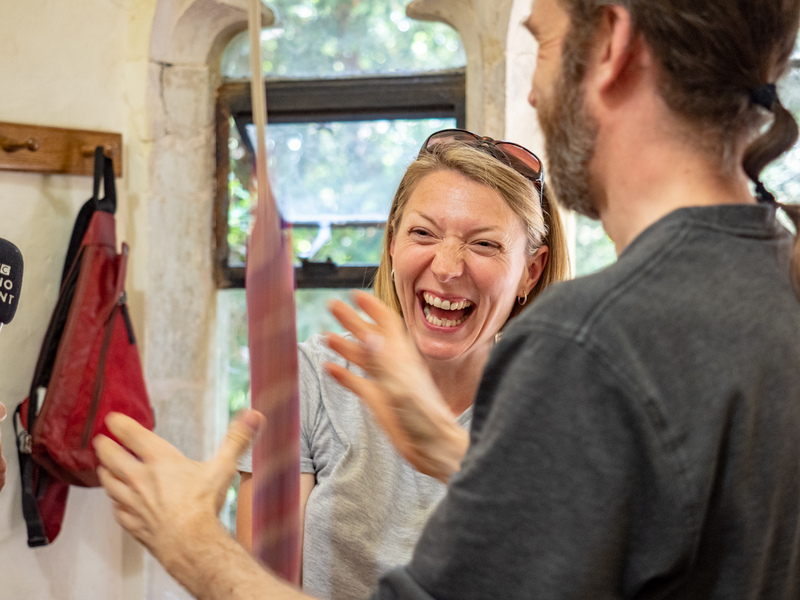 This was in the middle of Holy Trinity Fete when we had the tower open for the general public to have a go, so was a bit chaotic, a lot of fun, and there are some wonderful pictures (taken by Gary Marsh) of Katie Martin having a go herself! We have been advised that Katie Martin’s “piece” will go out on Radio Solent this coming Sunday morning at about 7.45 am – if anybody wants to tune in. Carol, Rita and me. I was the stranger in their camp. The rest of their small but regular gang having decamped elsewhere to make room for visiting ringers. But came there none. Except I. The evening was warm and bright and the Boy Scouts were on the cricket pitch in front of the church practicing their archery. Along came Carol, Tower Secretary followed by Rita, warmly greeting each other before extending that warmth to me. The ringing room is a little on the small side. But I bet the walls ring with fun and personality when all the band are present. Carol led the practice, with raising, lowering and she and Rita taught me a method for three bells. Plain hunt whole pull on 3 I think. I couldn’t hope to find better company to spend my leisure time with. They made me feel good about myself and about my ringing. To get that from your home tower is one thing, and indeed I do at Wonston, but to get that from your neighbour is another. I hope you get to meet Carol and Rita and the others at the District Practice at the next church along the valley, Preston Candover. They have a tremendous resource in that Candover Valley. All those churches, all those rings. But the greatest resource is the people and their passion and joy in making noise, welcoming all to the church and to themselves. is to continue to ring out across the land. The Wonston Bellringers were joined by colleagues from Micheldever and Winchester on 7th April, in ringing a quarter peal as a thanksgiving for the life of Valerie Keel who had sadly passed away on 4th April. Valerie was a long-established member of Holy Trinity Church where she was a tireless supporter, Tower Secretary, and a member of the Ladies’ Guild of Change Ringers. Val’s ready smile, together with her strength and fortitude over the last few weeks have been an example to us all. She will be enormously missed by everybody who knew her. The Wonston ringers would also like to include Coral Northeast of Sparsholt and Overton who died on 12th November 2017. Coral was a welcome visitor to Wonston, and remains a much-missed friend. Reminder: Winchester District Training Event at Wonston – Sat 7th April – 9.30-11.30 am. Just a quick reminder that our Training Morning for Grandsire is coming up this Saturday and to please let Jenny Watson know if you wish to attend to learn or if you can help. Should we not get enough people wishing to come for training, we’ll run the session as a District Practice, so what we’ll do will be guided by what people would like on the day. Edmund, John and I shall be there, so hopefully we can be useful. Our next training session, on Grandsire Doubles is fast coming up on the horizon, April 7th, three weeks today. This will suit people who can ring the treble to doubles methods; there will also be opportunities for people wishing to practise calling plain courses and touches of Grandsire. As usual please let Jenny Watson know by April 3rd if you wish to take part as a student or as a helper. Tomorrow’s regular practice at Wonston has been cancelled. Here, in three weeks’ time, is another opportunity for you to hone your raising and lowering skills, in peal. If you missed out on the Guild’s training session in February, or you wish to rehearse the skills you gained then, please come along. Places must be booked in advance by Wednesday 19th April. Let me know if you are coming, either as a learner or if you can help/stand behind. Look forward to seeing you on the 22nd. Also, DON’T FORGET! We have a District Practice at Twyford on Tuesday next, 4th April, 7.30-8.30, leaving plenty of time to check out the Phoenix’s selection of ales afterwards, if anyone is so minded. Beyond Bob Doubles will be at Wonston on 25th January at 19:30, anything from Grandsire Doubles through to Cambridge Minor, depending on who turns up. This event is open to any young ringers in the Guild. Please let Jen Churchill know via email or ‘phone call if you are attending to give her an idea of numbers for tea. BBD will be at Wonston on Wednesday 24th, I think we may struggle for numbers again this month, it would be helpful if you could let me know if you intend to come. We are always looking for new ringers. If you would like to join the team or visit us to find out more about this ancient skill, please join us on a Saturday morning.